Eager to spend quality time in nature? After lots of research and personal experience, we have compiled a list of helpful camping tips to keep in mind now so that you can begin prepping for the summer. First things first: Make sure you claim your temporary home in the wilderness. Use recreation.gov or reserveamerica.com to reserve a spot as soon as possible for the summer. *Many of these tips require everyday household items. While reading the list, make note of the items you'll need so that you can start putting them aside for your future trip. Pour coffee grounds into a coffee filter. Tie the filter closed with a piece of string into what will look like a makeshift tea bag. Boil hot water and steep the coffee bag into the pot. Enjoy your coffee in the great outdoors. *Needed Materials: Coffee grounds. Coffee filters. String. Collect lint from your dryer machine and empty toilet paper rolls. Next, stuff the lint into the toilet paper rolls. Take this home-made tool camping and use it to start a quality fire. Roast marshmallows, or simply enjoy the warmth. *Needed Materials: Dryer machine lint. Empty toilet paper rolls. Useful for: starting fires and making skewers. Find a twig and use a pencil sharpener to create a fine tip. Use the shavings to start a fire, and use the stick as a skewer to cook hot dogs or marshmallows. *Needed Materials: Pencil sharpener. Twig. As an ice bag. Freeze the water jug and place it in an ice chest with food items to keep them cold. For drinking water. Once you're done with the ice, let it melt and drink up. To make a lantern. Shine a flash light through the melted water and bam! Lantern. To make a shovel. Once the bottle is empty, use a knife to cut off the top and use it to scoop up things. *Needed Materials: Water Jug. Ice chest. Flash light. Knife. Useful for: bringing practical amounts of spices to the woods for savory cooking. Burn one of its ends. Pat the burnt end closed with a piece of cloth so that the melted plastic glues together. Pour desired spices into the straw. Burn the opposite end & repeat step 3. Label the straw with its corresponding spice using a Sharpie. Once you cut the end open to use for cooking, feel free to burn the end again to close back up. *Needed Materials: Plastic straws. A lighter. Spices. A Sharpie. Mend a tear in your tent or backpack. Cover a blister: The compression will easy the pain and keep it from getting worse. *Needed Materials: Duct tape. Water bottle. Take a few moments out in the wilderness to write down some of your thoughts. Writing in a journal is good for your emotional and physical health. There is increasing scientific evidence that shows how writing in a journal helps reduce stress and resolve conflicts with others. It's also a wonderful way to record the memories that you are making on your camping trip. *Needed Materials: Journal. Pen or Pencil. Willingness to write and reflect. We hope these tips will help you live well, do good and enjoy the great outdoors. In California? Need a weekend getaway? This one is for you. Big Sur, California. Biking, hiking, and stunning views are just a few of the categories for which this region takes the cake. One of the most scenic drives on the iconic Highway 1 exists between Carmel and Morro Bay — and better yet, you can stay there. Big Sur offers a few great overnight options. If you’re interested in being eco-friendly, take a tent and set up shop in either Andrew Molera State Park or in Big Sur Campground & Cabins. Want to be part of a community that takes luxury camping or “glamping” to another level? 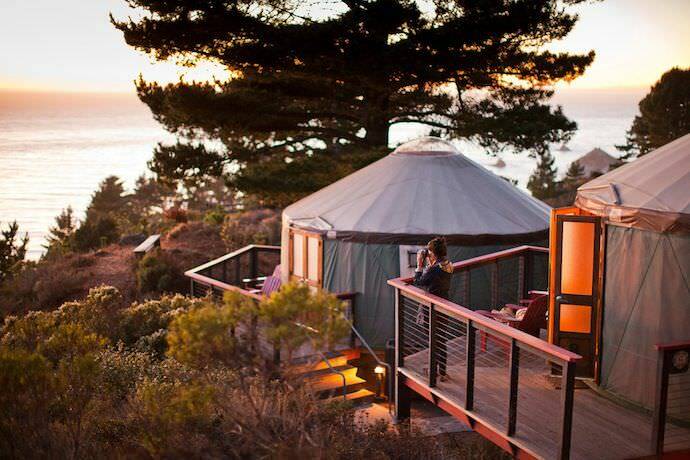 Check out the yurts over at the Treebones Resort which are equipped with an outdoor sushi bar and a heated ocean view pool and hot tub. For those who want to combine luxury, a spa weekend, and five star views, Post Ranch Inn is your spot. The way you can spend your days in Big Sur are truly endless. The hiking list is lengthy and many offer extraordinary views, including our favorite, the McWay Waterfall Trail. Some of the hikes even offer surprise endings at one of the most iconic hot springs in the region, Sykes Hot Spring. And of course there’s the beach where, if lucky, one may catch a glimpse of a sea otter resting on a bed of kelp or a pod of whales off in the distance. Big Sur offers anyone the opportunity to connect with a different community, the community of the great outdoors. So this weekend choose to be deliberate in where you go, be inspired, and enjoy the getaway. "It'll be easy - like riding a bike." How many times in the course of an average month do you hear that phrase? It's not without reason - by the best estimates, nearly 27 million Americans ride a bicycle at least infrequently, but it's nearly certain that many more have learned. It's one of the trials of childhood - your pedaling guru holds you upright on two suddenly too-skinny pieces of rubber, and lies, "You'll be fine." A few dozen skinned knees and elbows later, you usually are. The phrase 'like riding a bike' itself, though, is a colloquial and positive version of 'old habits die hard', and it's positive for a reason. There's the obvious positive that bike riding at any age gets you off the couch, but less obvious, perhaps, is the fact that twenty miles a week reduces risk of heart disease by half. Again: by half . While you're fighting heart attacks harder than whole wheat, you're also improving coordination, reducing stress, burning fat, and making your brain steadily more pleased with itself. 'Okay, okay we get it!' cry out the fact-bludgeoned readers, 'we'll think vaguely about riding a bicycle!' Thinking about it can't cut it forever. Researching for this post has made me realize that most cycling articles have two main effects: they make the reader feel either slightly guilty or morally superior. So far, the bicyclists are feeling pretty good about themselves (see this cartoon chart to understand), and we, the spokeless masses, feel a little grumpy. But what do we do? How do we become one of the enlightened, a... cyclist ? Here's the skinny: to be a cyclist, you only have to ride a bike. Amazing! Some gears, a chain, a handlebar, and a few brakes, and you will be welcomed into the elite echelon of bicyclists. And so, for the rest of this month, I challenge you to get out and ride one mile every day. That's all. By my count, that's something like six or seven miles. No sweat. Why? The first slow fingers of autumn are reaching out with crisp air, the kids are off at school, and the days are getting ever so slightly shorter. 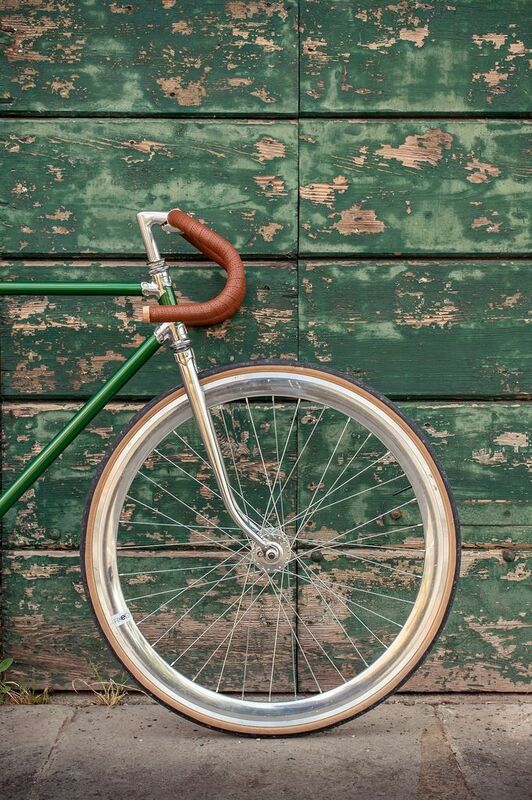 It's the perfect time for a bike ride.